Figure 39.1. QA003 Distribution 129, August 2014. (A) SPE gel accompanying report. Lanes 1-5: normal human serum (NHS); Lanes 6-10; QA003 serum. (B) and (C) sIFE gels accompanying report. No obvious monoclonal protein is visible. This sample contained monoclonal κ FLC by sFLC analysis. Figure 39.2. QA003 Distribution 129, August 2014. Frequency distribution of reported κ sFLC results. Red histogram: all participants; blue histogram: Binding Site SPAPLUS® results. The result from the reporting laboratory is indicated by an arrow. Figure 39.3. QA003 Distribution 129, August 2014.
sFLC results for normal sera and different patient groups represented on a dot plot. 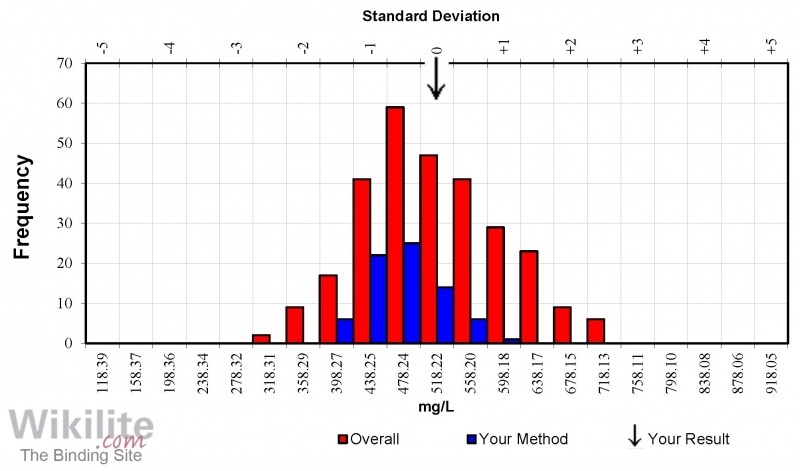 The result from the reporting laboratory and overall mean value are identified. 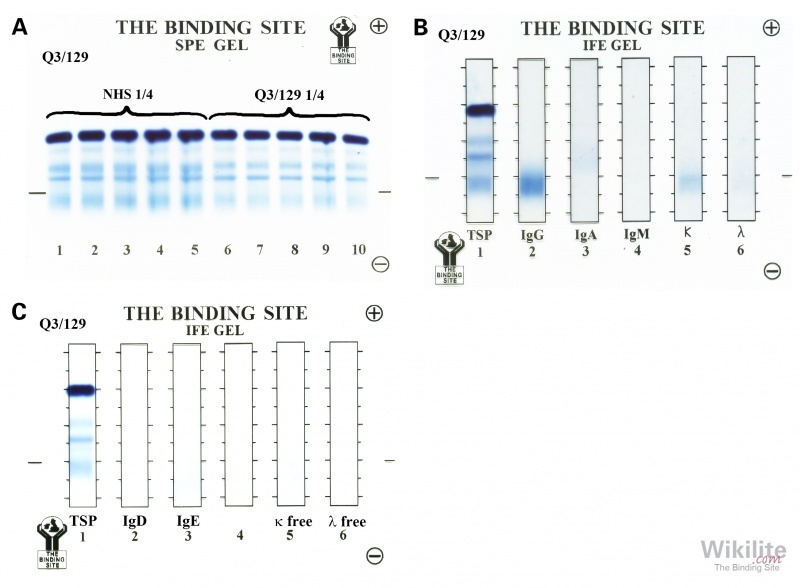 The Binding Site IMMPROVE™ serum paraprotein QA scheme (QA003) was the first scheme to include sFLC analysis. To date, there have been more than 70 distributions over 12 years, and over 300 laboratories worldwide currently participate in the scheme. Four serum samples are issued per year and results can be returned via the IMMPROVE website. Methodologies assessed include serum protein electrophoresis (SPE), serum immunofixation electrophoresis (sIFE) and sFLC assays (Chapter 4). Laboratories are able to return quantitative results for IgG, IgA, IgM, β2-microglobulin, κ sFLCs, λ sFLCs and the κ/λ sFLC ratio. A comprehensive report is returned to each laboratory in which sFLC results are categorised according to nephelometric/turbidimetric instrument type to allow user group comparisons to be made. The report also includes examples of electrophoresis gels and an interpretative comment regarding the sample and results. Electrophoresis and sFLC results from a typical QA003 report (Distribution 129, August 2014) are shown in Figures 39.1, 39.2 and 39.3. Whilst 82% of laboratories reported that no monoclonal protein was visible by SPE or sIFE, the majority of participants reporting Freelite® results identified monoclonal κ FLCs of approximately 500 mg/L. 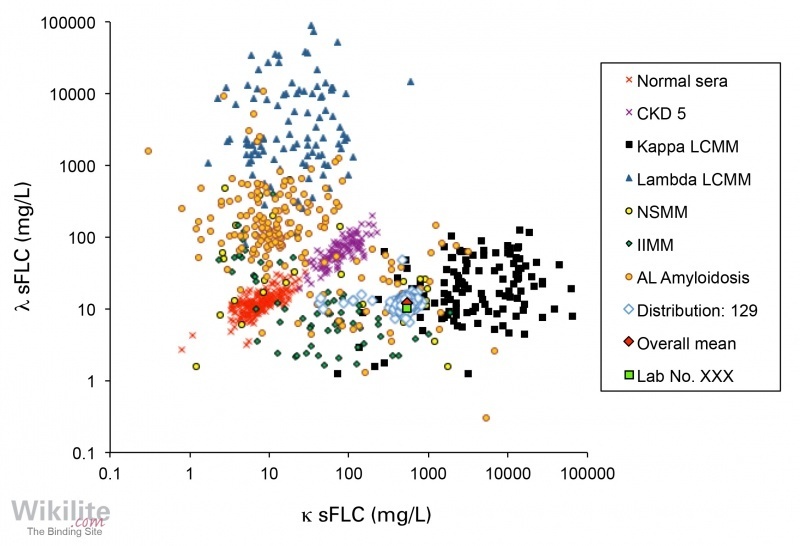 A small sub-group of laboratories reported significantly lower κ sFLC concentrations. This sub-group primarily consisted of laboratories using another (non-Freelite) method for FLC measurement. This distribution illustrates that absolute FLC values reported by other FLC assays may be significantly different to those reported by Freelite (Chapter 8).